Whether you’re getting a bowl of Thai noodle at a busy street stall or nibbling Pad Thai in a candlelit riverside restaurant, you’ll very likely find four permanent residents on any Thai table. Yes, those small ceramic or metal cups with mysterious-looking seasonings inside. One of them is clearly sugar, but ever wonder what the other three Thai seasonings and condiments are? To understand why seasonings are indispensable to Thai cuisine, let’s take a tiny step back and look at the bigger picture. 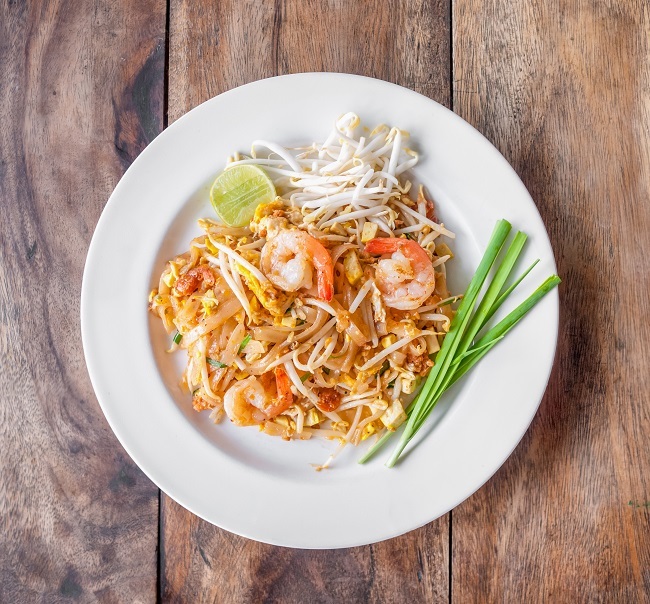 Thai seasonings and condiments: Classic Pad Thai. Time to squeeze off and spice up! Back in the early days, Thais were already familiar with four main flavors. These flavors consist of hot from peppers, sweet from sugarcane sugar, salty from northeastern rock salt, and sour from lime. All of these were locally grown and produced. But the real influx of myriad of unheard-of spices only came when international relations flourished. One of the groundbreakers was chili which has since taken spicy to the next level. Today, ground red chili is ubiquitous and also one of the 4 common seasonings that’s easier to distinguish. Some Thais consider ground chili the life of the party to their grub. Some even say it’s their survival seasoning when on a long holiday abroad. Thais sprinkle a varying amount (from a teeny tiny tip to almost 3/4 teaspoon) on Pad Thai, Thai noodle, Pad See Ew (wok-fried rice noodle in black sauce) or even Kra Poh Pla (Chinese-influenced dried fish maw soup). Thai seasonings and condiments: Before slurping your Kra Poh Pla (Thai Fish Maw), fleck some chilies and you’ll have a perfect local dinner! Moving on to the sliced pickled green, orange or red pepper floating in transparent liquid. That’s actually vinegar. You might have now come to an ‘Oh, I see. But what about the lime?’. According to our rule of thumb, it seems some dishes, like Pad See Ew, fare better with vinegar. Although once in a while we do come across one with a lime wedge on the side. As for other menus like Pad Thai, we recommend you squeeze the juicy wedge on your steaming noodle and make sure everything is nicely mixed. You can always ask for more lime if you’re hooked on the unique herbal scent and flavor like we are. At some noodle places, you’ll also encounter pickled pepper’s cousin, a thicker orange liquid with finely chopped red chilies at the bottom. The pickled vinegar is tangy and pierces right above any other flavors if put in too much.This vermilion component is often more spicy (the chopped chilies are self-explanatory). It also offers a subtly different taste of sour than its kin. On a personal note, we find Yen Ta Fo (Thai rice noodle in pink soup) one of the piquant seasonings’ best partner in crimes. With the right amount of the orange chili, the two seamlessly blend into each other. Together they make one of the most heavenly must-try Thai dishes. Last but by no means least, the clear brown liquid that smells, literally and figuratively, fishy. Fish sauce also has a deep-rooted and intimate affinity with Thai as well as Southeast Asian culinary arts. They play a major behind-the-scene role in steering most stir-fry dishes towards the right taste and scent. As for its onstage performance, a tad bit of fish sauce works wonders on a little-too-bland Thai noodle, Pad Thai or Pad See Ew. And yes, fish sauce has a close, although a little more advanced, sibling as well. Any food stall or restaurant has a tiny cup of fish sauce with chopped bird chilies. Sometimes you’ll also see an extremely thin sliced lime wedge floating in the cup. Again, this is just our personal opinion that we have exchanged and agreed between our Thai friends. This average (and mysterious) looking liquid is hands down a gem of a seasoning. 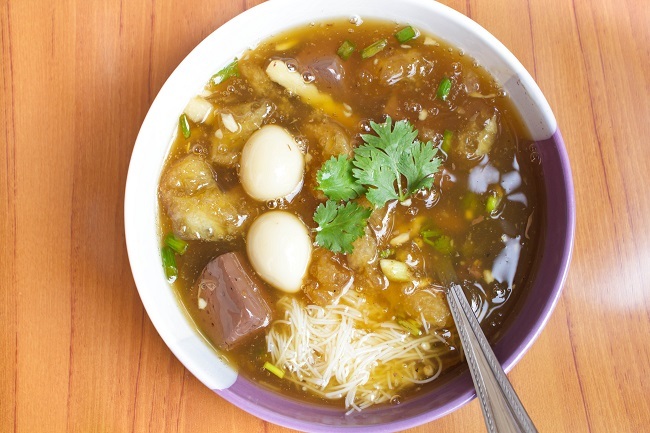 It’s very gregarious, as it glides smoothly with almost anything and everything from fried rice, fried noodle, fried egg and the list goes on. In case you aren’t too keen on the fishy tang yet have a love-hate thing with chili, simply sprinkle the desired amount of tiny reds and greens on your goodies and watch the marvel unfold. And voila! You’re now fully equipped with local insights into Thai seasonings and condiments. What lies ahead is a scrumptious journey. Our last tips would be to start by putting a tiniest amount of each because all the seasonings taste very strong. Besides that, keep in mind that there’s no right or wrong way to do it. It all depends on your preferences. Some Thais also like their food exactly how it comes. Even we mess up by putting too much of this and that in our bowl sometimes, too. The most important thing is to have fun introducing the gigantic army of Thai seasonings and condiments to your taste buds!